Academic-Capital: What is Behind the Painting of "The Bull" 1647? What is Behind the Painting of "The Bull" 1647? When is a painting just colors on canvas? Painting is a representation of life and the figures, creatures, and landscapes represent important aspects of societal living. "The Bull" is a painting that is central to farm life and animal husbandry. Yet "The Bull" is much more than a beautiful piece of artwork as it also represents something spiritual and thriving. Without the domesticated bull it is doubtful society could produce enough food to expand and grow. Paul Potter had a very short career in painting but during this lifetime he produced many great artistic works. He was born in the fishing village Enkhuizen and studied art from the warmth of his home. He lived with his father in Amsterdam for a while, went to the Delft for a couple of years and then to the Hague where he painted the famous work "The Bull" in 1647. After this time his career was plagued by crippling sickness and disease leaving a number of fine art works behind as a legacy. 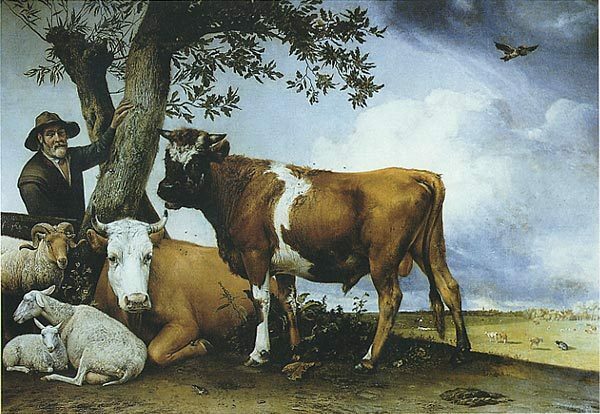 "The Bull" was considered one of his best works and represented the noble nature of the lord of the fields and pastures. The painting was huge measuring 8 feet 6 inches in height, by 9 feet 10 inches in width. At this time the masterpiece is still one of the most celebrated in Holland and draws thousands of visitors to the Hague Museum every year. It is seen as one of the early examples of Romanticism. Even though the painting has some apparent scale flaws it is seen as a detailed wonder with the smug indifference of the bull apparent. The bull has a central place in the significance of human life. To the ancient Celtics the bull represented fertility, to the Druids it represented power, and to most others it conjures images of power, wealth, and luxury. In the Jewish tradition the bull is seen as harmony and provision which is represented in the symbol of the Hebrew aleph. Throughout history the bull has been a creature of mysticism and spirit that could make the most ferocious predators run out of fear. To American farmers the bull (Bos taurus) is central to the herd of cows. Selecting the right bull allows for beneficial genetics in animal husbandry and a healthier overall flock. Bulls are often unpredictable and full of energy and require a nose ring to control effectively. They are often castrated to limit their temperament and size. Weighing 1,000-2000 lbs they can be aggressive with only 1 in 20 people attacked by a bull surviving. The bull has been known to have a central place in the economy since 2150 BC in the Epic of Gilgamesh. Cave paintings have been noted as far back as 17,000 years ago showing its companionship with the development of society. Of course who hasn't heard the term "bull market"? Even in today's stock markets the animal maintains its charm. A bull market can be a group of bonds, currencies or commodities. The bull market is one of optimism where psychologically investors believe the value of their holdings will continue to rise. Interestingly, one can even trade in bulls. With $80 billion in U.S. cattle market value each year there is no "bull" in this masculine creature. The painting of the bull represents its importance in the 1600's and maintains its relevance today. It is projected that this castrated animal will continue to breed important contributions in the future. No pun intended.